Cheetahs are one of the most amazing of all land mammals. Built for great speed, they are specialists when it comes to hunting fast, agile prey animals in broad daylight. Capable of reaching from zero to hundred kilometers an hour within a matter of seconds, they have evolved into developing a sleek and slender physique that aids them in their highly specialized lifestyle. Whilst a long and thin body enables Cheetahs to be fast and athletic, this also means that they are lighter and weaker when it comes to conflicts with other large predators of Africa, including lions, hyenas and leopards. The bigger animals waste no opportunity to steal a Cheetah's kill or kill its cubs. Cheetahs face other threats too. The most significant ones in the last few decades have been conflicts with human and loss of habitat. As human population and development increases in Africa, Cheetahs are finding it increasingly difficult to survive and take down their normal prey animals. As a result, they often go after herds of cattle owned by farmers. This brings them into conflict with people who at times shoot the big cats in retaliation. Then there is the problem of limited genetic diversity in Cheetahs. Cheetahs have evolved from a relatively restricted gene pool and face multiple biological threats owing to this. They are susceptible to diseases and genetic defects and infant mortality is high. 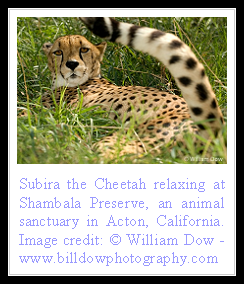 As a result Cheetahs are the most endangered of the three big cats in Africa. There are a handful of Asiatic Cheetahs in Iran too and research is being conducted to preserve them in their natural habitat. It remains to be soon, though if the successful efforts of Cheetah Conservation Fund can be replicated to help save the beautiful cats there. The need above all is to better educate the natives, in parts where Cheetahs coexist with humans around the world. A sustainable ecosystem can only be established through study and understanding of the animal's behavior and minimizing of conflicts between humans and predators. Cheetahs are such beautiful creatures and it's sad to see their natural habitat threatened by man. Thanks for bringing more awareness to their plight. Cheetahs are so gorgeous and amazing! Thanks for such a informative post on these beautiful animals! I am glad there are people who want this great cat to survive. Too many animals are threatened as man continues to encroach on their territory. Cheetahs are such amazing big kitties. Thankies fur such a great post on them. It's so sad that so many of the big kitties are endangered species. Thank U for recently visiting my page.